"Mario & Luigi: Partners in Time, known in Japan as Mario & Luigi RPG 2x2 (マリオ&ルイージRPG2), is a console role-playing game developed by AlphaDream and published by Nintendo for the Nintendo DS handheld game console in 2005. It is the fifth game in the Mario RPG series, and is the sequel to Mario & Luigi: Superstar Saga for the Game Boy Advance. A successor to the game, Mario & Luigi: Bowser's Inside Story, was released in Japan on February 11, 2009, and in the US on September 14, 2009. Although the sequel to Superstar Saga, the game's plot is unrelated to that of its predecessor, with an emphasis on the time-traveling theme, which involves the protagonists traveling between the past and present of the Mushroom Kingdom. The adventure follows Mario, Luigi, Baby Mario, and Baby Luigi as they search for Princess Peach, who has been abducted by an alien species known as the Shroobs. The gameplay centers on the co-operation between the quartet, who must use their specific qualities and skills to solve puzzles and thus progress through the game. Partners in Time features multiple role-playing game elements, but with a turn-based battle system focused on timing accuracy. The game is similar to that of its predecessor, but is considered darker in tone. 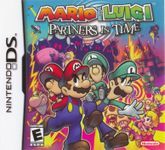 Partners in Time was positively received by the media, gaining an aggregate score of 86.80% from Game Rankings and a 87 from Metacritic. Like its predecessor, the game was praised by critics for its characterization and comical style, as well as its use of the DS's dual screen." Source: Wikipedia, "Mario_&_Luigi:_Partners_in_Time," available under the CC-BY-SA License.